After dealing with multiple successful Mobile App, Mobikul has now come up with a new Hybrid app. The Opencart Hybrid Mobile App is meant to convert your website on default Opencart to an app. The app is more advanced as it uses the functionality of a Web app over a native container. It uses the theme of the website and could be downloaded from Google Play Store and iTunes store. The app provides the customer view of the website. The app will allow the customer to shop for the products from an app which will operate on the smart devices in their hand. Thus, aiding the store owner to generated more profit. Quick creation of the apps which are much efficient. A consistent theme of the website and mobile app which enables easy navigation. OTP (One-Time-Password) verification available (*Add-on)(For OTP feature in-app it needs to be enabled on the web-end). Real-time synchronization with the web store – products, categories, orders, customers, etc. *All Add-ons comes underpaid customization features. For a responsive theme, your website theme should also be responsive. The pages here are as per your default Woocommerce store which changes as per website. After receiving the prerequisite information, your e-commerce hybrid mobile apps will be instantly developed and will be published on Google Play Store and Apple App Store. You can publish your mobile apps either from your own account or choose Webkul’s Google Play and Apple App Store account. So, you can get the APK and IPA files once the apps are developed completely. Now, let us walk through the Opencart Hybrid Mobile App and see all the features and functionalities it has. Post installation of application the customer opens up the app. The app opens up with an introductory splash screen followed by an informative Homepage. This section contains a list of exclusive products which admin or store owner wishes to showcase on the homepage. This will act as a showcase to the customer. Thus encouraging them the purchase of more products. This section is meant to list in the set of the category, that the customer can use to navigate to view the site. These categories are linked to Sub-category(ies), then it can be re-directed towards the Collection page. Now the customer can select a product to view the product detail page. The customer gets redirected towards the collection page on clicking a particular category. The customer can click on a particular product to visit the product detail page. Here on collection page, the customer can sort the product list and set the number of items that will be visible on the page. However, on the moving to the product page, the customer can view detail of the product like the description and features of the product. Accessing the products the customer can easily add the products to the cart by clicking on ‘Add to Cart’ by stating the quantity of the product. The customer can write a review of the product from here post usage. The banner can be used by admin to showcase various store related information like Sale, offer, new arrivals, etc. 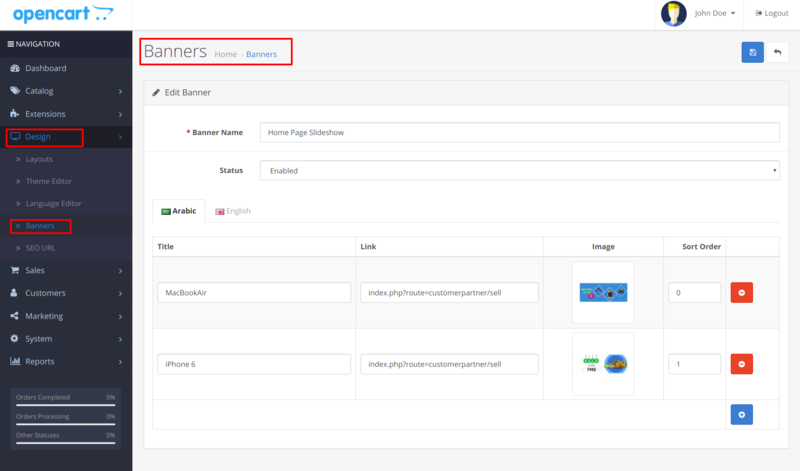 This can be done on Default Opencart by following the navigation, Design>Banner. So, the Banner can appear in the form of a slide that customer can glide through. The Contact us page can be used by the customer to view the Contact details of the admin. It mainly comprises of Address, Telephone number and contact form. Then the customer can login the application by entering the E-mail address and Password. The customer can update there password by navigating to Account>Password section. The customer now can update the password of there account anytime easily. The customer can save detail address which can be used at the time of checkout. The customer can follow the navigation as- Account>Address Book>Add Address. This section is meant to display the list of the order placed by the customer. So, the customer can view the orders and verify the status of the order. The customer can add the product to wishlist and buy it later. Multiple products can be added to the wishlist and can be shared with friends as well. The customer can easily place the product in the shopping cart and view them later on to purchase the product. There is an icon of the cart on the top right corner. On clicking the icon the customer can view the list of products. The customer can then click on checkout button in the cart page to redirect to checkout section. Here in the checkout page the customer can re-check or re-enter the billing address as well as the shipping address. Then the customer can select the desired shipping method as per choice. Note – All the shipping methods that are available on the Opencart web store will be visible on the mobile app as well. Hence avoiding the requirement of separate module/integration work. After which the customer can select the desired Payment Method. Note – All the payment methods that are available on the Opencart web store will be visible on the mobile app as well. Hence avoiding the requirement of separate module/integration work. Finally, the customer can review the order and place the order as per wish. The customer will see a success message once the order is placed. For quickly finding the products from the catalog, the customer can use the search box and type a name or, word or phrase that describes the product. The results will start appearing that matches the search query. The app supports multilingual feature where the customer can set the app as per the desired language. This is one of the major components to attract the local customer. The customer can select the desired currency as per choice among the choices provided by app admin. Both the method localizes the application to the desired choice which could help in the attraction of maximum customer. That’s all for the Opencart Hybrid Mobile App, still have any issue feel free to add a ticket here – webkul.uvdesk.com and let us know your views to make the module better.